Diamond Program | Seeru Travel Corp. Courier Fee $50.00 per family. Interline connections from any US city, available. 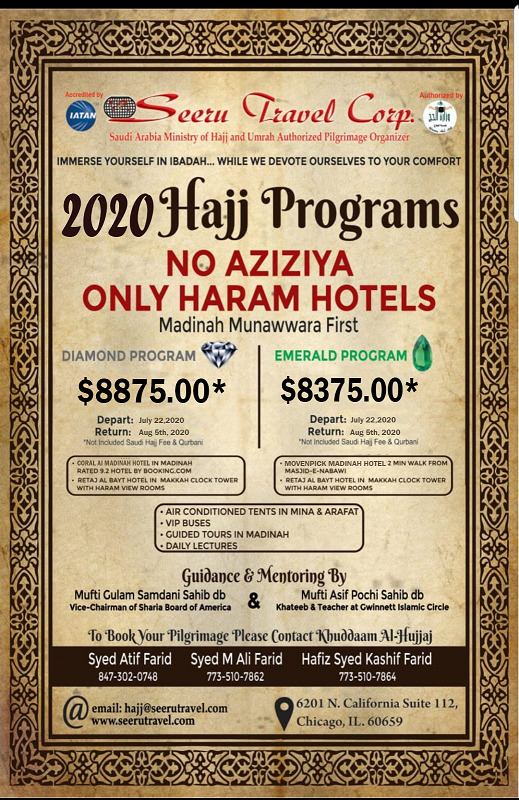 Side trips before or after Hajj, available. 3 nights in Madinah Munawwara. Dallah Taibah Hotel Opp.from Ladies gate # 25 of Masjid Nabawi. Upgraded air-conditioned American tents in Mina & Arafat with sofa bed in Mina only. Food, hot, cold beverages in Mina and lunch in Arafat. 4 nights at Retaj Al Bayt Hotel opp. Haram Shareef, Makkah Mukarrama. 0 meter from Haram Shareef opp. Bab Malik Abdul Aziz gate # 1. Ground transportation: Madinah/Makkah/Jeddah in VIP coaches. Mufti Gulam Samdani sahib will accompany the group. 24-hour personal assistance by Khuddam Al Hujjaj accompanying the group.